MOON TOWNSHIP — The RMU men’s basketball team celebrates after a made three-pointer against Sacred Heart (Samuel Anthony/RMU Sentry Media). 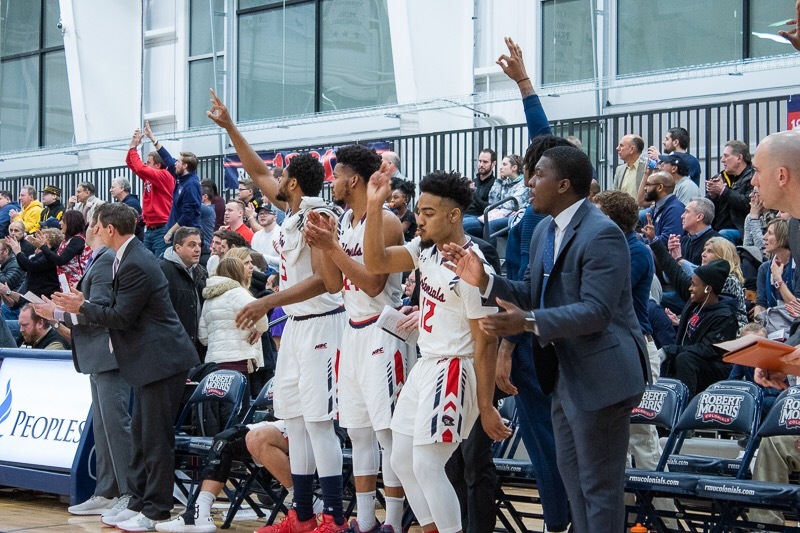 MOON TOWNSHIP — After winning their last two home games against LIU Brooklyn and Saint Francis Brooklyn, the RMU men’s basketball team (15-14, 10-6 NEC) is looking to round out their final two games of the season on a road trip to New York and Connecticut. On Thursday, the Colonials face off against the Sacred Heart Pioneers (13-16, 9-7 NEC) at 6:00 p.m. in Fairfield, Connecticut, and end the trip against the Wagner Seahawks (13-14, 8-8 NEC) in Staten Island, New York, at 4:00 p.m. on Saturday. In their last two games, RMU beat the Saint Francis Brooklyn Terriers (16-13, 8-8 NEC,) as well as the LIU Brooklyn Blackbirds (13-15, 7-9 NEC.) In both games, RMU was losing at halftime, by eight points against the Terriers, and by five against the Blackbirds. While RMU may have shown their ability to face adversity in these wins, they will need to make sure games don’t get away from them so much that they cannot climb out of the hole. Thankfully for the Colonials though, their strong second half performances have kept them tied for second place in the NEC, with the possibility to obtain the first spot. With a 9-7 record in the NEC, the Pioneers hold sole possession of the fourth spot in the conference, and are coming off a 80-66 victory against the ninth ranked Central Connecticut State Blue Devils. The Pioneers also hold a record of 8-2 when playing at home this season, while RMU has a 4-11 record in away games. The Pioneers however, are a lot more streaky of a team than RMU has been. The Colonials have two four-game winning streaks since starting conference play. The Pioneers, on the other hand, had three wins against Mount St. Mary’s, St. Francis Brooklyn and Fairleigh Dickinson which was their longest win streak of the season. So the Pioneers may be coming off a large victory, but they haven’t shown the ability to stay hot for too long so far this season. When the Seahawks visited Moon Township earlier this season, Wagner lost to RMU by a score of 51-57. Wagner is currently 8-8 in conference play, tied for fifth place, and only has three wins against the teams ranked 5th or better in the conference. Wagner’s previous two games have been losses as well, which came from the seventh place Bryant Bulldogs (10-17, 7-9 NEC,) and the second place Fairleigh Dickinson Knights (15-13, 10-6 NEC.) The Seahawks currently hold a record of 7-5 when playing at home, and are hosting the first place Saint Francis Red Flash before hosting the second place Colonials on Saturday. Matty McConnell (RMU): So far this season, McConnell is averaging 9.8 points per game, and had 12 points in both of the Colonials previous wins. 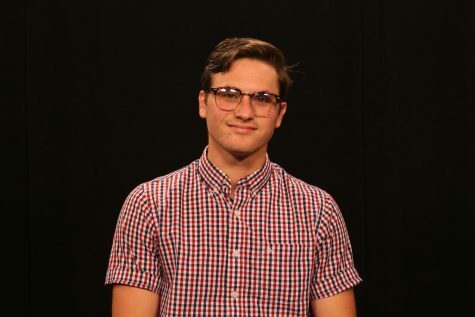 If RMU wants to win out the season, McConnell will need to provide the spark of energy that he brings on both offense and defense for the team. Josh Williams (RMU): In the second half against Saint Francis Brooklyn, Williams hit four three-pointers and also had nine second half points against LIU Brooklyn. Williams, who leads the team with an average of 14.3 points per game, will need to continue being an offensive leader, especially in games where the Colonials enter the second half down a few points. Sean Hoehn (SHU): Hoehn leads Sacred Heart on offense with an average of 17.6 points a game, and is coming off an 18 point performance against the CCSU Blue Devils, which the Pioneers won 80-66. While the Pioneers do have three players averaging in the double digits for points, Hoehn is their leader on offense, and will rely on him again when they face off against the Colonials. Romone Saunders (Wagner): Saunders leads the Seahawks in overall points, with an average of 16.5 points per game, while the next highest average is Elijah Davis, who averages 11 points a game. Wagner averages just 66.5 points a game total, while RMU averages 69.6 a game, so Wagner will need their standout scorer in Romone Saunders if they want to win. If RMU wants to have a chance at first place in the NEC, they will need to start by winning out against these two teams, amongst other things. Both of these games, however, are very winnable, and I think that as long as neither Sacred Heart or Wagner jump out to too large of a lead early on in the game, RMU should be able to keep it close and win both. RMU will also be looking to heat up in their final two games of the season, and regardless of spot, will be using these two games as a springboard heading into the NEC Playoffs.